Lever hoists offer special advantages over all other hoists - they can be used in any position and orientation, which means you don't have to have the load hanging vertically from the hoist. Frequently called a "come-along", these hoists use a ratchet mechanism by which you pull down on the lever handle to lift the load (or tighten a retaining cable/chain). 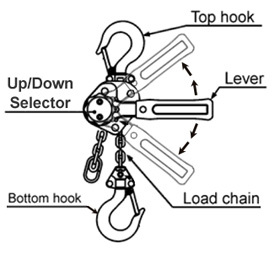 On the up-swing of the lever handle, the mechanism slips past ratchet points until you begin a downward pull on the handle, at which time it again engages and cranks the chain higher (or tighter).